How Are Abbott's Emergency Items Doing? Gov. Greg Abbott declared five emergency items in his State of the State speech, clearing the way for lawmakers to act quickly on them if they so choose. Here's a guide to the five items, related bills and where things stand. It's been less than a month since first-term Gov. Greg Abbott picked five items that he declared emergencies and — presumably — placed on a legislative fast track. 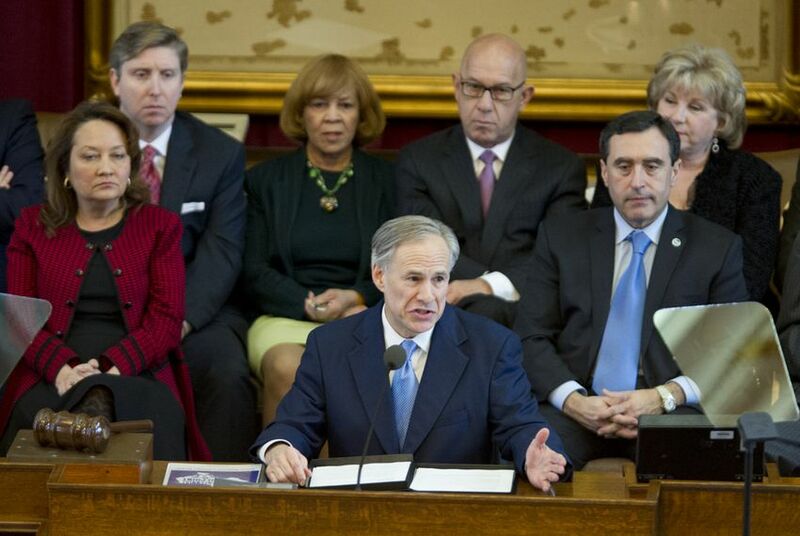 As the Legislature closes in on its 60th day, Abbott's wish list faces its first checkpoint. During his Feb. 17 State of the State address, Abbott gave lawmakers the green light to expedite work on border security, early education, ethics reform, higher education research and transportation funding. By declaring them emergency items, he not only cleared them for votes before the 60th day of the session but also gave a high-profile boost to the causes. Some issues, like border security and transportation, are picking up momentum. Other emergency items were generally well received, but the devil remains in the details, and opposition will only come into focus as the session heats up. "Governor Abbott is committed to working with all members of the Legislature to accomplish their shared goals of strengthening Texas' economy, elevating our education system, securing the border, building more roads and enacting the ethics reforms that Texans deserve," Abbott spokeswoman Amelia Chasse said in a statement. The first 60 days have offered an early look at Abbott's ability to work his will on the legislative branch. Especially at this stage, some lawmakers say Abbott and his team have been more hands-on than former Gov. Rick Perry's office was — a welcome change in most cases. Among those who have taken note of Abbott's style: state Rep. Dennis Bonnen, R-Angleton, the author of a far-reaching border security bill that is on its way to the full House. "He's been very wise to engage early and engage often with the members themselves so that we can make sure we're all working together," Bonnen said, suggesting Abbott is not anxious to use the veto pen for which Perry was infamous. "The governor's going about this in a far more proactive and positive manner where I don't think that's an issue he's having to throw around and it's not his style." State Sen. Van Taylor, who has taken the lead on ethics reform in the upper chamber, said he talks "almost daily" with Abbott's office about the legislation he's working on. The Plano Republican said the "level of contact and the amount of resources" dedicated to the cause is a "stark contrast" with his experience during past sessions. "I've never seen this before," he added. Abbott has pressed his agenda, including the emergency items, in small-group meetings with lawmakers at the Governor's Mansion. He had senators over last month and is dining with representatives this month. All the while, his legislative team has been regularly meeting with top staffers from both sides of the aisle. Bill Miller, an Austin lobbyist and political consultant, said he sees Abbott's emergency items humming along at this stage, partly thanks to a seasoned legislative staff that knows the Capitol inside and out. He brushed off the idea Abbott is still in the honeymoon phase, saying it is more like the governor and the lawmakers are "getting acquainted at the dance and the partners like each other." Here are Abbott's emergency items, his related proposals and some of the legislation that corresponds with those proposals, according to the governor's office. Also included is where the bills are in the legislative process if they already have been filed. Abbott has proposed doubling funding for the Department of Public Safety so it can add "manpower, technology and tools for added surveillance." House Bill 11 — Authored by Reps. Dennis Bonnen, R-Angleton; Larry Phillips, R-Sherman; Rene Oliveira, D-Brownsville; Eddie Lucio III, D-Harlingen; and Tan Parker, R-Flower Mound. Approved 8-0 on Wednesday by the House Committee on Homeland Security and Public Safety and sent to the full House. Senate Bill 3 — Authored by Sen. Brian Birdwell, R-Granbury. Scheduled for subcommittee hearing Monday. Senate Bill 877 — Authored by Birdwell. Filed March 2. Abbott has proposed forming "Reading Excellence Teams" that would be available to schools with low third-grade reading scores. Senate Bill 935 — Authored by Sen. Lois Kolkhorst, R-Brenham. Referred Monday to the Senate Education Committee. Rep. Joe Deshotel, D-Beaumont, is expected to carry similar legislation in the House. Abbott wants to set up training academies for teachers who are focused on reading and writing. Senate Bill 925 — Authored by Kolkhorst. Referred Monday to the Senate Education Committee. House Bill 1842 — Authored by Rep. Jimmie Don Aycock, R-Kileen. Referred Wednesday to the House Public Education Committee. Abbott has proposed establishing training academies for teachers who teach math to students in kindergarten through the third grade. Senate Bill 934 — Authored by Kolkhorst. Referred Monday to the Senate Education Committee. House Bill 2609 — Authored by Rep. Marsha Farney, R-Georgetown. Filed Monday. Abbott wants to offer funding to districts that put in place prekindergarten "with the goal of demonstrating long-term prekindergarten success." House Bill 4 — Authored by Reps. Dan Huberty, R-Houston; Joe Deshotel, D-Beaumont; Ken King, R-Canadian; Helen Giddings, D-DeSoto; and Trent Ashby, R-Lufkin. Left pending Tuesday in the House Public Education Committee. Senate Bill 801 — Authored by Sens. Judith Zaffirini, D-Laredo, and Donna Campbell, R-New Braunfels. Referred March 3 to the Senate Education Committee. Abbott wants to prohibit Texas lawmakers and statewide elected officials who are lawyers from earning referral fees or "receiving any benefit from legal referral." House Bill 1531 — Authored by Rep. Charlie Geren, R-Fort Worth. Referred Tuesday to the House Committee on General Investigating and Ethics. Sen. Van Taylor, R-Plano, is expected to carry similar legislation in the Senate. Abbott has proposed requiring quarterly campaign-finance reporting by state legislators, statewide elected officials, candidates and political action committees. House Bill 1532 — Authored by Geren. Filed Feb. 17. Taylor is expected to carry similar legislation in the Senate. Abbott wants to prohibit campaigns and political action committees from spending any donation that exceeds $5,000 and was received within 30 days of an election until the contribution has been disclosed to the Texas Ethics Commission. House Bill 1533 — Authored by Geren. Filed Feb. 17. Abbott has proposed requiring all state lawmakers, statewide elected officials and gubernatorial appointees to disclose any contract, subcontract or "paid relationship" they or their spouses may have with a public entity. Geren is expected to carry the legislation in the House. Taylor is expected to carry the legislation in the Senate. Abbott wants to prohibit state legislators from voting on bills from which they stand to financially benefit. Abbott has proposed prohibiting school districts from using taxpayer dollars to hire lobbyists on their behalf. Rep. Matt Shaheen, R-Plano, is expected to carry the legislation in the House. Abbott wants to eliminate the Emerging Technology Fund in anticipation of using its leftover money for other purposes. House Bill 523 — Authored by Rep. Phil King, R-Weatherford. Referred Feb. 18 to the House Committee on Economic and Small Business Development. Abbott has proposed using leftover money from the Emerging Technology Fund to start a Governor's University Research Initiative that would help lure world-class scholars to Texas universities. Senate Bill 632 — Authored by Sen. Troy Fraser, R-Horseshoe Bay. Referred Feb. 23 to the Senate Committee on Natural Resources and Economic Development. Rep. Drew Springer, R-Muenster, is expected to carry similar legislation in the House. Abbott wants to end diversions of gas tax revenue to purposes other than transportation. Senate Bill 5 — Authored by Sens. Robert Nichols, R-Jacksonville, and Jane Nelson, R-Flower Mound. Passed 28-2 on March 4 by the Senate and sent to the House. House Bill 1370 — Authored by Rep. Larry Phillips, R-Sherman. Referred Monday to the House Appropriations Committee. Abbott has proposed amending the Texas Constitution to devote two-thirds or more of the car sales tax to the state highway fund. Senate Joint Resolution 5 — Authored by Nichols and Nelson. Passed 28-2 on March 4 by the Senate and sent to the House. House Joint Resolution 91 — Authored by Phillips. Filed Feb. 12.